Home made rubs. Taking flavor by the horns. As summer is warming up and grills are being dusted off, grill masters all over are preparing for grilling season. Dry rubs are a common way to season meat, among other things, especially in the south. If you decide to create a dry rub at home there are a couple of tips to get the most from your home made seasoning blends. The most important tip is to use the freshest herbs and spices you can find. FYI: Herbs are leaves, Spices are seeds, basically. Try not to use dry herbs over 1 year old. The flavor is probably reduced or gone completely depending on how you store them. Use fresh herbs whenever possible . Your spices should be whole, not ground. This allows you to do what we almost always do with our spices before using them, toast them. Toasting is easy and it really brings out the entire depth of flavor you want from spices. To toast spices, place them in a hot skillet and constantly move until you can smell them. You may even see a little, tiny bit of smoke. Be careful not to burn as they may become bitter. If preparing a wet rub use olive oil or butter not vegetable oil. Vegetable oil is fine but lacks the sweetness and flavor of olive oil and butter. Below are recipe utilizing these practices. Please use them, enjoy them and make them your own. Place the peppercorns and mustard seed In a dry, medium hot skillet and stir for about a minute. When lightly toasted and aromatic, grind together in a coffee grinder or mortar and pestle. Chop all your fresh ingredients very fine. Mix everything together with the salt. Pre rub your steaks with olive oil or butter and then rub the spice blend you just prepared into steaks before grilling. the olive oil or butter aids in bonding the oils from the rub and infusing it into your steak. Grill as you normally would and remember to let the steak rest before cutting. Resting meat allows the succulent liquids to evenly redistribute. Cutting into meat directly off the grill will allow the liquids to run out, and they will, draining your perfect steak, making it dry and less tasty. Cut the Habanero pepper in half and remove the seeds and stem. Place in a hot dry skillet and toast until outside begins to turn black. Hold the pepper so you can do this as evenly as possible. Remove the pepper and lay skin side up and gently scrap off the charred skin. Mince and place in a bowl. Place the cumin and black peppercorns in the pan and stir until fragrant. Grind and add to minced Habanero along with the fresh cilantro. Zest the lime. For those unaware of zesting, the zest is the very outside skin of citrus. You can zest a lime with a zester or a cheese grater. So, zest the lime and place the zest in the bowl then juice the lime into the bowl as well. At this point if you want a marinade add about a cup of orange juice or concentrate if you like. Rub pork chops with this seasoning blend or marinate them if you like. 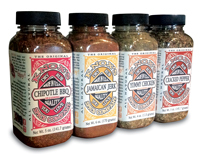 Knox's BBQ Rubs are made from the highest quality herbs and spices we can find and we blend them using whole or 'Fancy' cuts when available. We do this so when you rub Knox's BBQ Rubs into your meat the herbs are broken releasing the flavor. Dry rubs that are already ground fine have a tendency to loose their flavor faster and nobody wants that to happen. So take the information we have given you and go make rubs at home that are excellent. Just remember use fresh ingredients and toast your spices to get all the wonderful flavor you can.